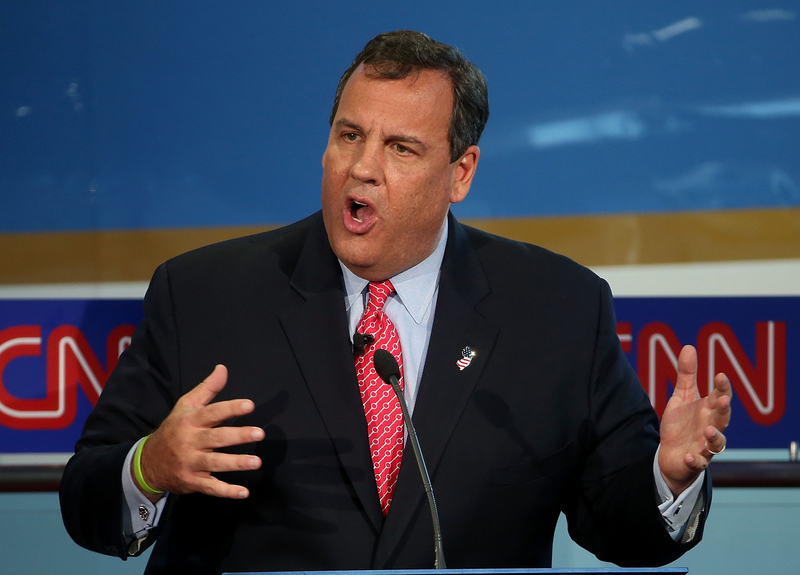 Chris Christie Is One To Watch In The Third GOP Debate Because We're Still Waiting For Him To Go "Nuclear"
Of all the candidates, Chris Christie is probably the one who lost out the most with Donald Trump's entry into the Republican race. After all, with a slogan of "telling it like it is," Christie was known for his unapologetic "keeping it 100" attitude toward policy and politics. Trump arguably took that unique flavor away from the New Jersey governor and branded it as his own. But while poll numbers might not show it — he's polling at 5 percent in his own Garden State, according to a Rutgers-Eagleton poll — Chris Christie is still one to watch in the upcoming GOP debate. Anyone can have a breakout moment. Carly Fiorina's had two. I'm not completely ruling out a Cinderella story for Christie, but I'd like to believe that he'll use the third debate stage as an opportunity to step out of his glass slippers and stomp all over his opponents' toes — both metaphorically and literally (how awesome would that be). Whether he'll be successful remains to be seen, but with time (and likely money) running out, Christie has got to make some pretty dramatic moves to make waves with Republican voters. And given his track record, he's more than capable of meeting that challenge. Here's why you should keep an eye on little ol' Christie in the corner. In May, Christie unveiled his approach to reducing income inequality, which included simplifying the tax code to three brackets, lowering income tax rates, and getting rid of the payroll tax for anyone older than 62 or under 21. It's up to you whether or not you agree with his economic plan — his plan appears to benefit those in the highest tax bracket the most, dropping their income tax from the current 39 percent to 28 percent — but at least the man's got a plan and he made it public! Less could be said about his fellow candidates. In the first debate, Christie counted 20 questions that went by without him. During the second debate, Christie went 32 minutes without being called on. Not to say he's going to pull a Jim Webb or anything, but given his past promises on going "nuclear" if he's ignored, Christie just might manage to force himself in the heart of the conversation instead of remaining in the stage's peripheral. On Sunday, Christie was famously kicked out of the quiet car of an Amtrak train for reportedly talking too loudly on his phone. Pictures of him exiting with a strawberry shake in hand made their rounds on Twitter. Since then, there's been some dispute over whether he was actually screaming on the phone. But the debate stage is no quiet car. If there was ever a time to talk loudly, it'll be Wednesday, so you do you, Gov. Christie. He Still Needs To "Tell It Like It Is"
In his campaign slogan, Christie promised to "tell it like it is," and while much of it was hijacked by Trump, frankly, I'm still waiting. Could Wednesday finally be the night he lets it all out? Make sure to keep an ear out for Christie.